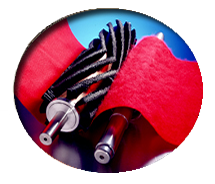 The Industrial Brush Company offers a complete line of Conveyor Cleaning brushes for a wide range of domestic and foreign machines. Each brush is designed and manufactured to provide superior performance and extended brush life. Industrial Brush Blanket Washers are especially suited to clean or wash conveyor blankets. Increased brush stiffness is attained by arranging bristles in clusters of tufts. The Spiral design makes the brush easy to clean avoiding costly down time. A variety of spirals are available depending on actual brushing requirements. Scrubber brushes do exactly what their name implies. Rough scrubbing is accomplished by utilizing the correct bristle pattern and fill material. We offer many synthetic bristles, wires or combinations of filaments to satisfy the most demanding requirements. 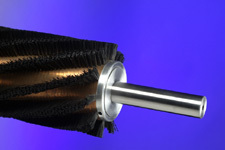 Drying brushes are generally used after a washing or scrubbing application. High speeds (to generate adequate air flow) are made possible with our balanced metal-core units. Each brush core is manufactured using stainless steel components to combat the effects of corrosion. 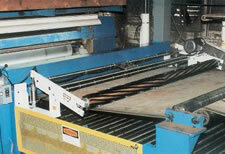 Dry cleaning endless belts, blankets or conveyors is usually done with our herringbone designed brush units. 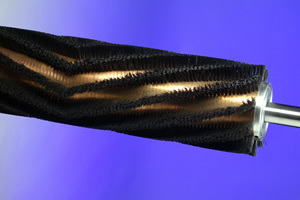 The bristle pattern pushes foreign matter to the sides of the conveying system. It also helps tracking when cleaning light-weight, unstable belt materials. Our brushes scrub and clean all kinds of conveying materials. They are custom designed to satisfy customer's specific needs. Our Engineering department will design a brush unit for your specific needs. Brush size, pattern, location, speed, and power requirements are all part of our recommendations to you. We also work with OEM machine builders that offer complete bolt-on blanket cleaning stations. We encourage you to contact us to discuss your conveyor or web cleaning needs.